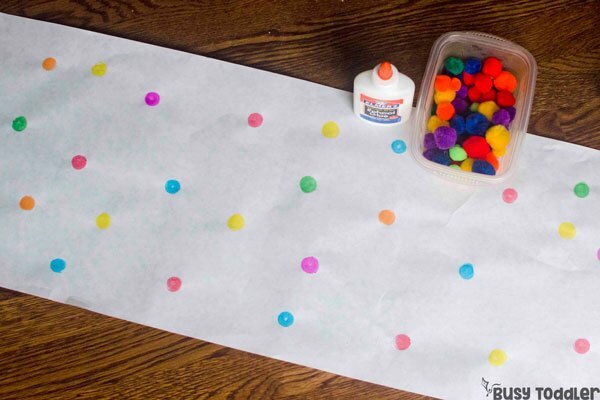 You’ve got to try this preschool fine motor activity – it’s the bestest. 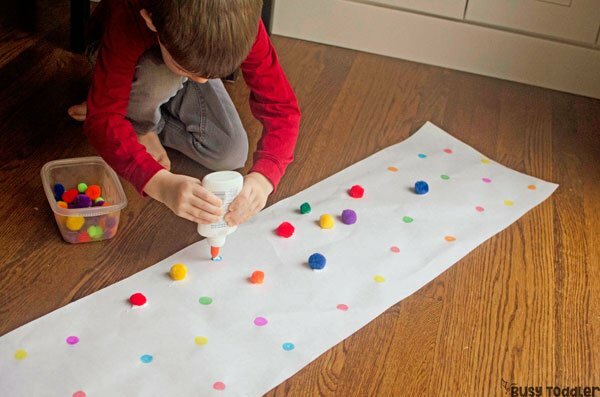 If you give a preschooler a glue bottle…he’s probably going to want to squeeze every last drop of glue out of that thing and see what happens (insert laugh cry face). Either that or if you give a preschooler a glue bottle, she might not know what to do with it because guess what? 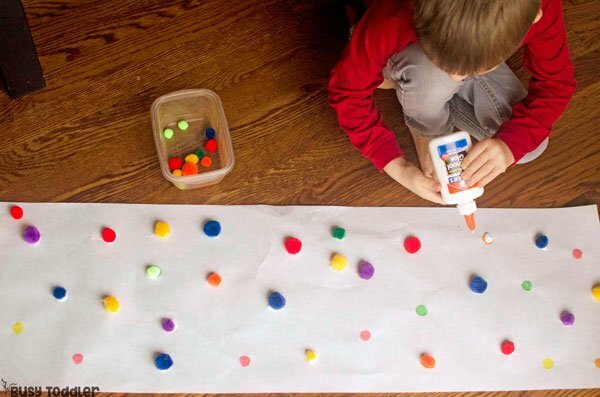 Kids need to practice gluing – it’s not a skill they’re born with. That’s why this match and glue preschool fine motor activity is basically the most awesome activity for my 4 year old. Life skills aka the skills our kids will need throughout their lives are so important. 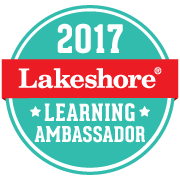 It’s not enough to just assume kids will learn to cut, pour, measure, and glue (for example) on their own – we need to teach them. 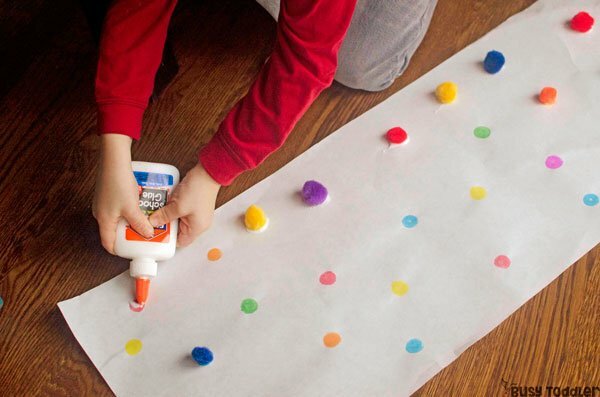 That’s why I love a good life skills activity – and this one is all about learning to use a glue bottle with precision. Some activities come out JUST right. I was stoked with how this one ended up and basically did a happy dance and said a lot of BOO YAHs as I finished prepping it. Don’t worry: it only took a few minutes to set up. 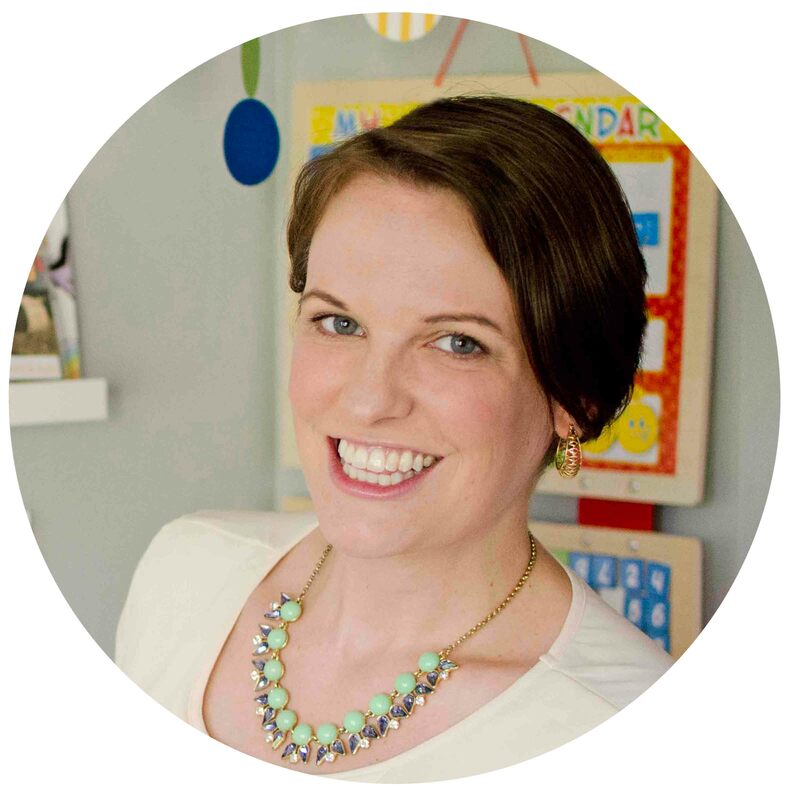 It’s so important to me that activities are easy to get going – who has time for some long, time consuming set up? This was just a fast few minutes to give my preschooler something to work on for more than 20 minutes. I’ll take that return of investment any day. I rolled out my beloved butcher paper and taped it to the floor. 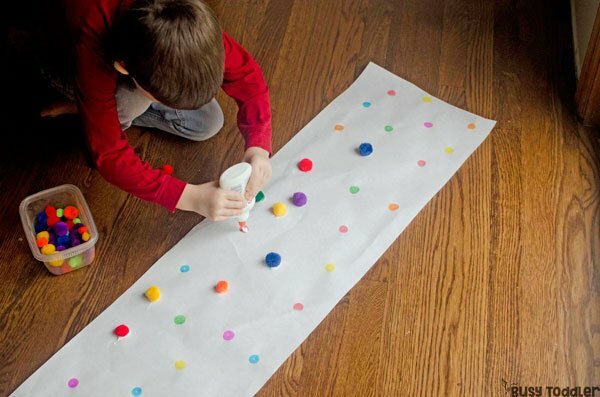 I snagged our Do-a-Dots and dotted that paper up and down. Then I grabbed our bag of pom pom balls, tossed aside the colors that didn’t match the Do-a-Dots, and set the “good colors” in a bowl. Game on. 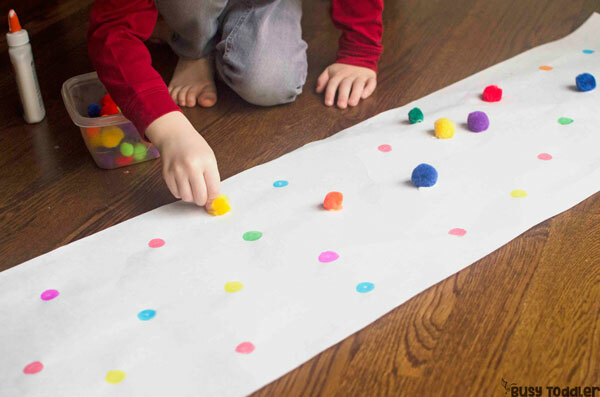 My 4 year old’s task: match the pom pom ball to the Do-a-Dot circles and then glue it on. 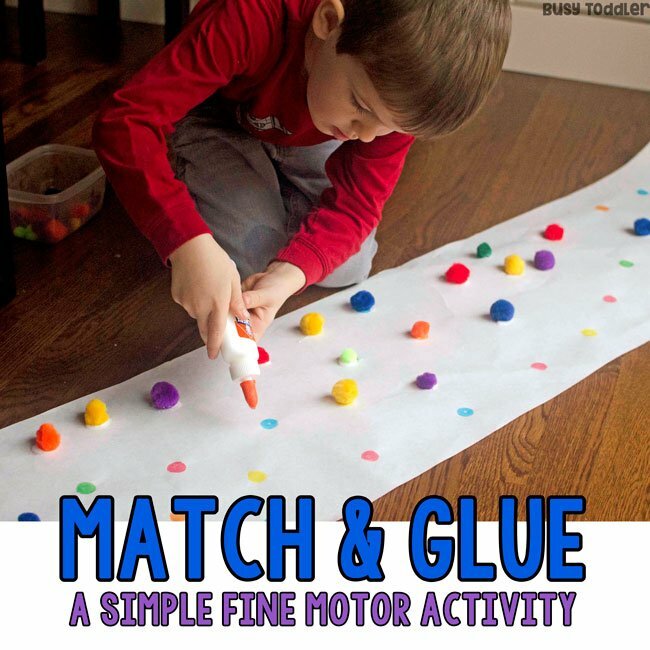 Match and glue – so much concentration, so much focus and hard work… I had about 40 dots on this page and my son worked tirelessly to match and glue the pom poms down. 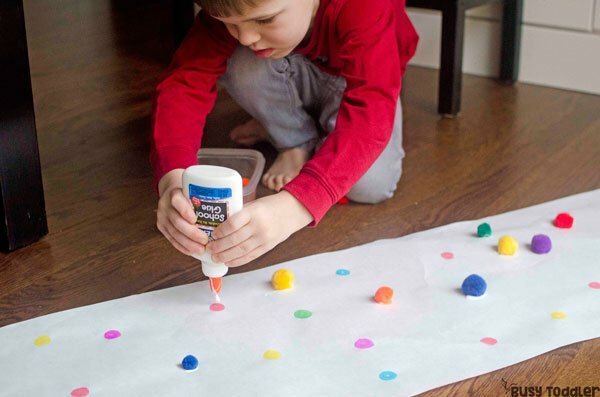 If this is your child’s first go with wet glue, make sure to model model model – show them the ins and outs of using glue and how to be successful with it. Looking to teach your child to cut? 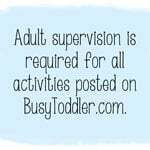 Check out “A Year of Scissor Activities” from Munchkins and Moms. 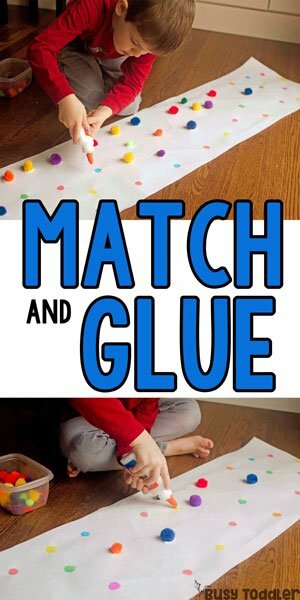 Playing match & glue was a perfect morning activity for my preschooler and one that he loved. I loved giving him the chance to practice this important life skill in a super fun activity. You know what else I loved? Being able to sit and have a nice hot cup of coffee while he worked. When will your child play Match & Glue?